Launched last year to celebrate the University’s diversity and inclusion initiatives, Belmont’s second annual Diversity Week was held Monday, October 24 – Friday, October 28 and included many opportunities for the Belmont community to engage in important dialogue and experience diversity on the university’s campus. Beginning with a Diversity Forum, the week’s highlights included two “Real Talk” sessions where faculty, staff and students were led through a facilitated discussion regarding diversity and inclusion efforts, an opportunity for faculty and staff to discuss implicit bias and micro-aggressions and an interactive art project centered around individual diversity, among other things. Throughout the week, service opportunities were offered at local nonprofits where members of the Belmont community engaged in community service with fellow Nashvillians. Serving at Second Harvest Food Bank, The Word Wagon and the Nashville Rescue Mission, among others, more than 60 individuals came together to serve. On Friday, the week culminated with a special keynote address by Metro Mayor Megan Barry. 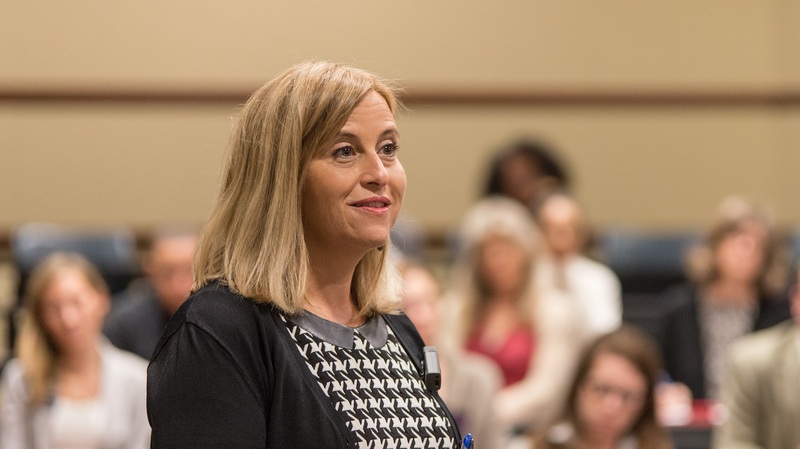 During her time on campus, Mayor Barry discussed Nashville’s diversity initiatives, her vision for Nashville’s future as it relates to diversity and inclusion and what Belmont can do to further that vision. Mayor Barry discussed her commitment, since her first day in office, to be sure her team reflects Nashville’s diversity. Seeing the government as the ultimate “convener,” the Mayor said the city will become more and more diverse and inclusive when the government understands its ability to bring people of all backgrounds together for important conversations. An initiative of Belmont’s Welcome Home Team, Diversity Week was created to provide an opportunity for faculty, staff and students to celebrate the diversity represented on Belmont’s campus and facilitate important conversations surrounding existing and upcoming initiatives. For more information, click here. For images from the week’s events, click here.